50 lines / inch with a total spacing of 20 mils can carry 1.0 A.
Kapton polyimide ribbon with copper cladding is sold as Pyralux. Another possibility is to use ribbon cables glued down to form an array–called Premo-Flex and Etched Polyimide. 1 ft cables are $1/cable on ebay. Most linear motor designs require an H-bridge controller for each coil. The coils are activated in turn, each with a duty cycle of 1/X, where X is the number of rounds needed to activate all the coils in a highest cycle driving case. This depends on the type of mover used–the number of coils needed to drive it and their arrangement. It also depends on whether one or more movers is utilized. One or more high and low side pair are activated to turn on coil(s), then additional sets in turn to complete a duty cycle. The driving current can be higher as the heat generated depends primarily on the total active time x current. I made a single coil of 10 turns using varnished wire from an inductor, 34 gauge (~0.16 mm wide). The wire was laid down on a piece of tape, and then covered with a layer of tape. Each 10 turn arm is 3 mm wide, and they are about 4 mm apart to match the magnet pair. The coil arms are slightly too far apart–by about 0.5 mm. At 1.4 A, the magnet could pull 2.5 g. The pull test was done on a sled of teflon tape using known weights. 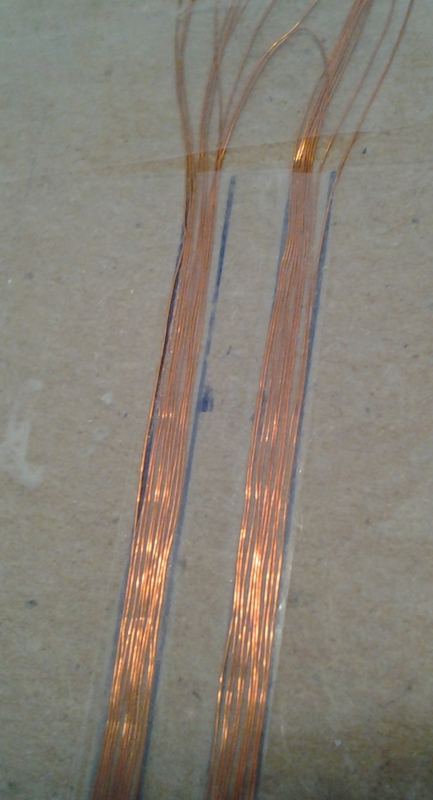 Test 2: A single coil of with one turn was made using varnished wire from an inductor. The wire was laid down on a piece of tape, and then covered with a layer of tape. The loops are 7 mm apart to match the magnet pair. At 1.35 A, the magnet moved, but just barely. At 2.0 A, the magnet could pull 0.3 g. The pull test was done on a sled of teflon tape using known weights. Coil 3 mm wide with two layers of turns, 5-6 per layer. The wire is varnished wire from an inductor, 34 gauge (~0.16 mm wide). At 0.9 A, can pull the two magnet sled with 100 g. At 2.1 A, it can pull the sled and 200 g. At 2.1 A, it will pull the sled magnet 2-3 mm away to its center. At 0.9 A, it will pull the sled from 2 mm away. A 2-layer circuit board with 6 mil traces and 6 mil spacing can fit 9 turns in 3 mm, with 1 mm between coils to allow for running the wire. The two layers would be 1.5 mm apart, the board thickness. 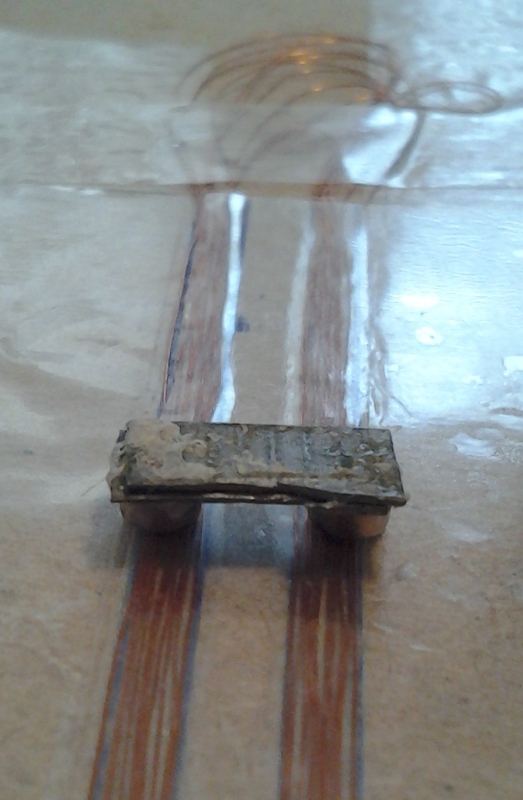 A board with coils every 3 mm could use a 1 cm x 1cm square magnet, and pull it with 3 coils at a time. 3 mm coils would require 15 x 15 coils in a 2″ x 2″ board, and a driver with 15 high and 15 low arms delivering 1 – 3 A continuous power, or 3X – 5X with driver running each coil only a subset of the active period.